If you’re one of those who just love having all their favorite video hubs under one roof, then you might want to give MacroTube a try. 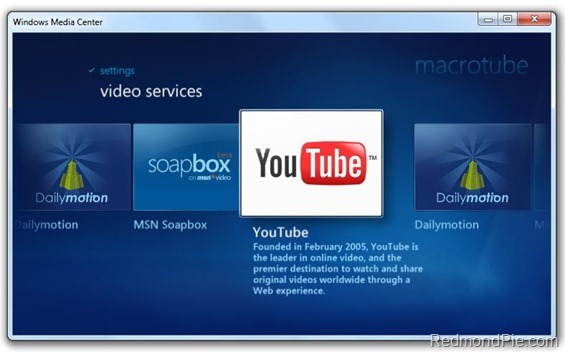 MacroTube for Windows 7 Media Center lets you watch YouTube videos easily from the comfort of your couch. Watching YouTube videos from a 10-foot experience (in Windows Media Center) is a whole new experience. The user interface of Media Center for sure is an eye candy to a lot of people (including myself), and going through media on your PC or online is just fun. Adding YouTube to Media Center is simple, you just have to install a handy little third party plug-in called MacroTube. After MacroTube is installed, you’ll see the YouTube link straight away on the main screen of Media Center and searching for video is the same as you would on YouTube’s website. You can search by relevance, by date or by rating.